With lumber, ceramic tiles, lighting, molding, tools, cabinetry, even antiques ready to be refurbished or refreshed, this place has everything a DIYer could ever want. 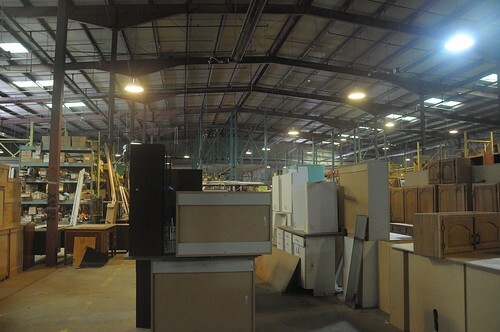 But even better, Community Forklift promotes green building — it keeps reusable materials out of landfills and makes repair and renovation projects more affordable for everyone in the community. It’s a little tricky to find, but well worth the visit. We went on a Sunday morning when traffic was light. And as an added bonus, the College Park IKEA is just a 10-minute drive away (get two fun trips for the price of one!). Their inventory changes daily, but here’s a peak at the type of items you will find. Outside, there are slabs and slabs of granite and marble. You’ll have to find someone else to cut the size you need, but you’ll get a great deal. 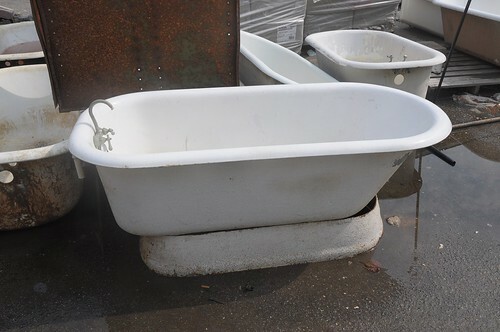 Need a tub? They have standard styles and even a few claw foots (not pictured). 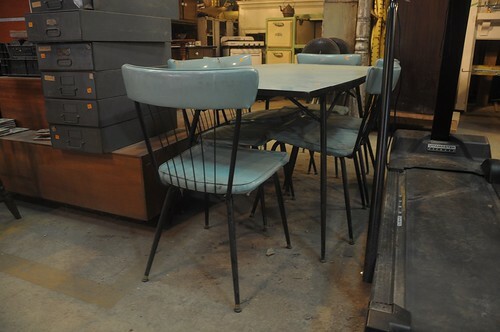 Love this vintage dining set in a cool blue — six chairs and a table for $75! 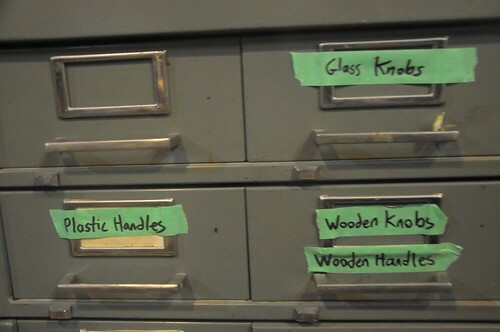 And note those industrial file drawers to the left — perfect for storing tools and craft supplies. 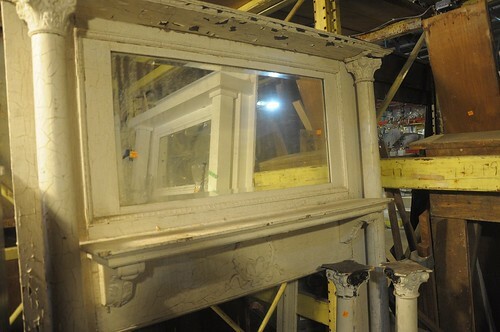 There were a bunch of these antique mantles — if only I had a fireplace! 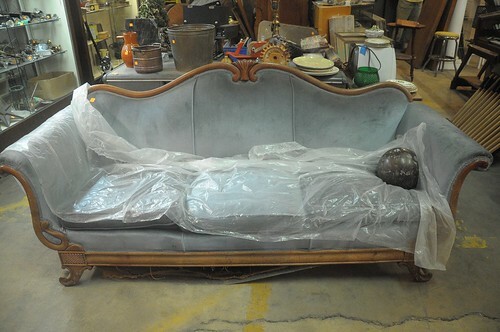 They would also make a fabulous headboard for a bed. Don’t know if they actually work, but we saw several vintage stoves. I wonder if you could convert one into a storage cabinet. 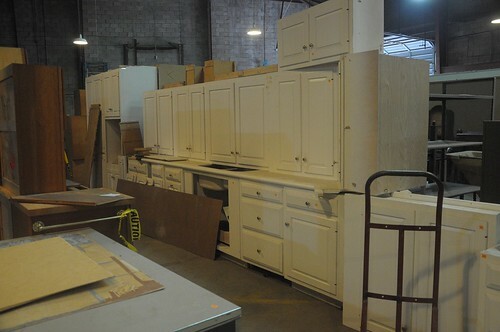 Rows and rows of kitchen cabinets — these look like new and they’re dirt cheap! So much treasure — this place is huge. 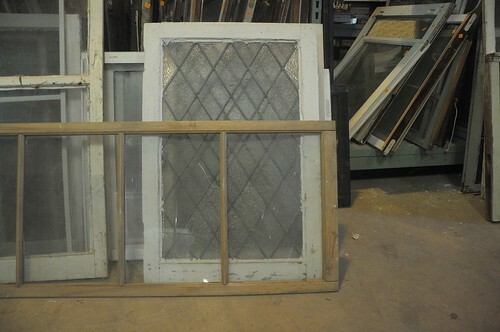 I’m kicking myself for not snatching this fabulous window (no clue what I would do with it, but it’s awesome!). 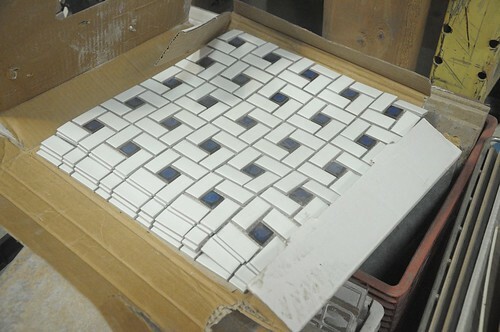 When we left, a fellow shopper was purchasing these classic blue and white tiles (looks like enough for a small Del Ray bathroom). 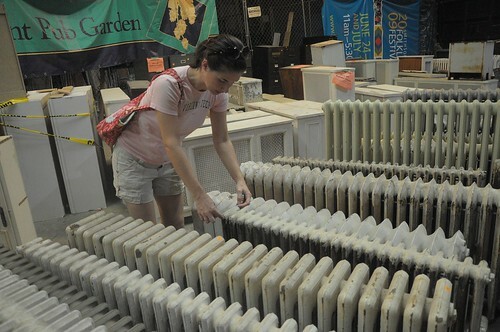 Mary measured radiators for a construction job. She found one for $160 — new, these cost over $1,000. 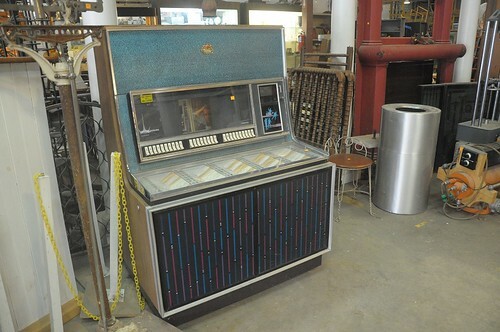 Wouldn’t this jukebox be awesome at Los Tios? 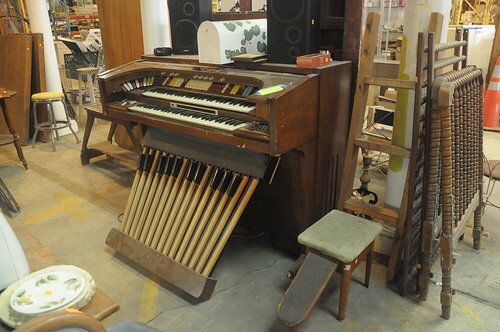 Whose house doesn’t need an organ? Although I’d be concerned about using an antique crib for a baby, that charming Jenny Lind-style one to the right could be repurposed somehow. 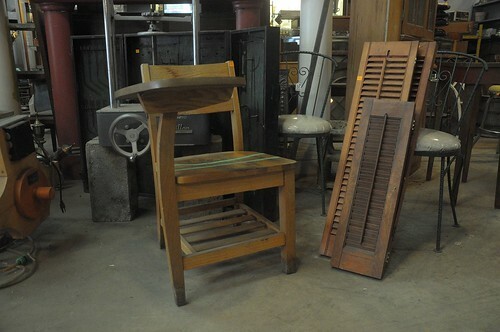 Also note: fab retro yellow stool on the left. 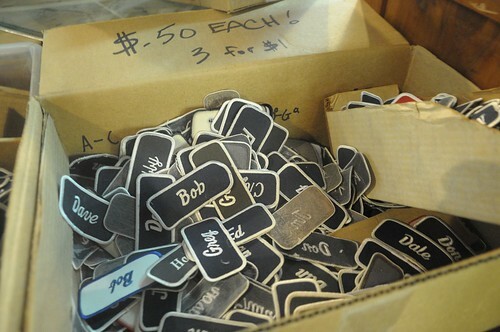 I looked for my kids’ names — lots of Bobs, Garys, Dales, and Jeffs (sorry, no Jack and Calvins). Sadly, there’s no room for this old school desk in my house, but would be great if we had just one more nook to fill. Plastic, wood, and glass knobs galore. This is only the tip of the iceberg. There is soooo much more to see. Bring a friend and your measuring tape (and a large vehicle) and get ready to plan your next DIY project. Visit the Community Forklift website for hours and driving directions. They also have a Facebook group and Twitter account so you can get the inside scoop when new treasure arrives. 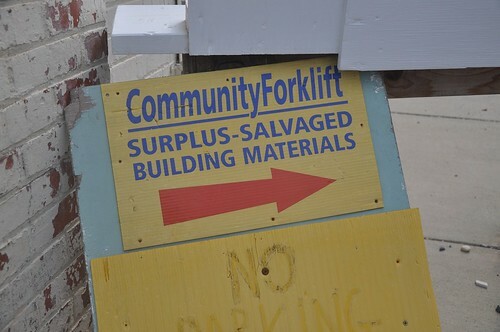 Have you been to Community Forklift? Tell others in the comment section about your experience. Thanks for the great tip – I can’t wait for an open weekend to visit this place! Let us know if you get anything good! Looks like a great place to visit! 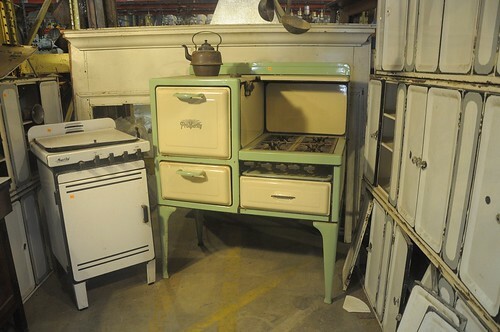 Those antique stoves could be made into wonderful play kitchens by someone more ambitious than me! Thanks for this post! I just emailed it to my husband to tell him WE NEED TO GO! Depending on your need/skill, the most cost effective way to cut granite (and other stone) is to buy second hand circular saws on Craigslist for ~$10 ea. then buy a dry stone blade at your favorite big box store (~$60) and cut away to your heart’s content. You’ll probably burn up a motor on the circular saws along the way but that’s why you buy them second hand. What is important is that you get a good blade and take care of it – keep it cool (frequent breaks to cool off). Also, ear (noise) and nose (dust) protection is critical. Not as good as Community Forklift but just as cheap, visit ReStore down Route 1 or out in Manassas. (http://www.restorenova.org/). Wow! Ruthie from Community Forklift staff here. Thanks SO much for visiting, and for letting folks know about us!!!! (We’re a typical nonprofit with a tiny budget, so we don’t have money for advertising. Therefore, we really rely on folks like you to spread the word to local communities). About the antique stoves: due to insurance costs, few small repair shops can afford to fix them anymore – I’ve heard that you have to ship them to someplace out in the Midwest. But they are often purchased by cafes to use as hostess stands. One woman purchased one to use as a plant stand on her porch. We recently sold a non-working vintage fridge to a fellow who plans to use it for an entertainment cabinet in his living room, to store his game console, DVDs, etc. 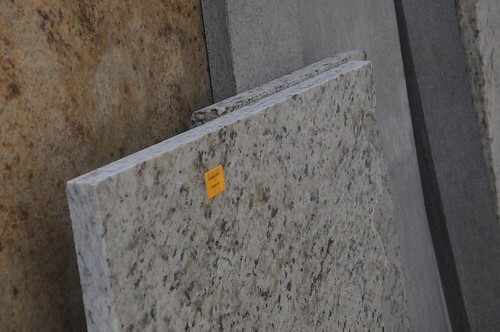 About the granite – if you’re too nervous to cut it yourself, we do have a handout at our front desk listing several nearby granite fabricators who are willing to cut the stone. We can’t guarantee their work, but we have put them on the list because we heard from customers who were pleased with their work and/or price. Thanks for that additional info Ruthie! And we look forward to coming back to Community Forklift and checking out your awesome deals! I’ve only just discovered your DIY Del Ray site, which I love, and was even more pleased to see the attention you gave to Community Forklift! I’ve been a big fan of theirs since I first discovered them in their first year, and I always tell my clients and friends about them. We’ve found some great buys there, and I’ll keep on recommending them highly. A terrific place to visit whether you have something specific in mind or not, and an even better place to support. Your write-up on them is wonderful. On another note, I’m really enjoying exploring your site (particularly your attention to “green”) and will recommend that to clients as well. Thanks! Thanks Lili! So glad you like the site and find it useful. We’re always looking for content ideas, so if there’s anything you’d like to see or have a project or room/house to share, please let us know!